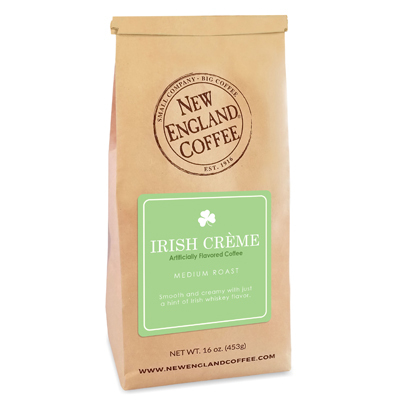 A spirited blend of our signature coffee with just a nip o’ flavor of Irish whiskey and smooth fresh cream. This is one of my favorites. I wish it did come in the k-cups as well. One of your best flavors! Please offer it in k-cups soon. This is AMAZING! Please offer in K-cups!! Irish Creme is one of your best blends. Should be regular, not seasonal. When will it be available again? I purchased several flavors over the past 6 months and bought several k-cup inserts from a local store. Nothing stops me from your delicious coffee. I will order the Irish Cream today. Looking forward to you restocking Cinnamon Churro, Strawberry Cream and Caramel Macchiato as well. This delightful minty taste is great and so smooth. This is my favorite flavor as always!!! As I have written before I hope you will make Irish Creme a regular offering instead of seasonal. I have used up my last order and now must wait until next seasonal time. Others flavors will substitute, but not as exceptional as Irish Creme. When will it be available again? Looking to purchase — has awesome flavor by itself and also blended with chocolate cappuccino. Want to place order, when will you have back in stock?